This tartlet is perfectly sized for a two- or three-bite dessert—just enough to provide a satisfying sweet ending to a meal. Chef Birnbaum also bakes up these mini-indulgences to include on sampler plates for the table to share. Cheddar cheese and fresh ginger provide savory notes to the sweet apple filling. Prepare Dough: In large bowl, combine flour, sugar and salt. Cut in butter until mixture forms small pea-size pieces. Add cold water and work by hand to form a soft dough. With floured hands, shape dough into a flat square. Refrigerate at least 1 hour. Roll dough 1/8-in. thick, using small amounts of flour to keep it from sticking to work surface. Cut into 12 rounds, 5 3/4-inches each. Spray twelve 3-inch round molds, about 1 1/2 inches deep, with cooking spray; dust with flour. Shape dough into molds, trimming excess from top of molds flat with rims. Refrigerate. Prepare Apple-Raisin Mixture: In large saucepan, combine apples, raisins, cider, vanilla bean seeds, sugar, honey, salt, cinnamon, ginger, cloves and butter. Cook over medium-low heat just until apples begin to soften. In small bowl, blend lemon juice and cornstarch; add to apple mixture and stir well. Cool in refrigerator. When cool, fold in cheddar; set aside. Prepare Calvados Sour Cream: In small bowl, combine apple brandy, sour cream and sugar; set aside. Prepare Cinnamon Sugar: In small bowl, combine cinnamon and sugar; set aside. Preheat oven to 375°F. Line tart crusts with foil and weigh down with pie weights. Bake 10 minutes, or just until crusts begin to brown. Remove foil and weights; fill each tart shell with equal portion of apple-raisin mixture. Bake about 20 minutes or until the filling bubbles and crust is golden brown. 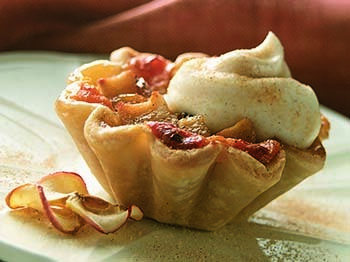 To serve, garnish each tartlet with generous spoonful of Calvados Sour Cream and sprinkle with Cinnamon Sugar.